Students, faculty, and staff at The Claremont Colleges get FREE RIDES on Foothill Transit buses all semester long! If you’re a student, faculty, or staff at Pomona College, Claremont Graduate University, Scripps College, Claremont McKenna College, Harvey Mudd College, Pitzer College, Keck Graduate Institute, or The Claremont Colleges Services (TCCS), bring your current ID to the Connection to get your free Class Pass! Please enter full phone number. The Class Pass is a free card that gives current students, faculty, and staff at The Claremont Colleges and The Claremont Colleges Services (TCCS) unlimited rides on Foothill Transit buses. It also helps the entire community by reducing traffic and parking congestion around campus. Not bad for a piece of plastic. The Class Pass is accepted on all Foothill Transit Local and Silver Streak buses, which connect to 22 different cities throughout the San Gabriel and Pomona Valleys, plus downtown Los Angeles. HOW DO I GET MY CLASS PASS? Just bring your current faculty, staff, or student ID to the Connection and ask for your Class Pass. If you lose your Class Pass, visit the Connection, pay a $10 replacement fee, and you’ll get a new Class Pass on the spot! Which Bus Lines Serve The Claremont Colleges? 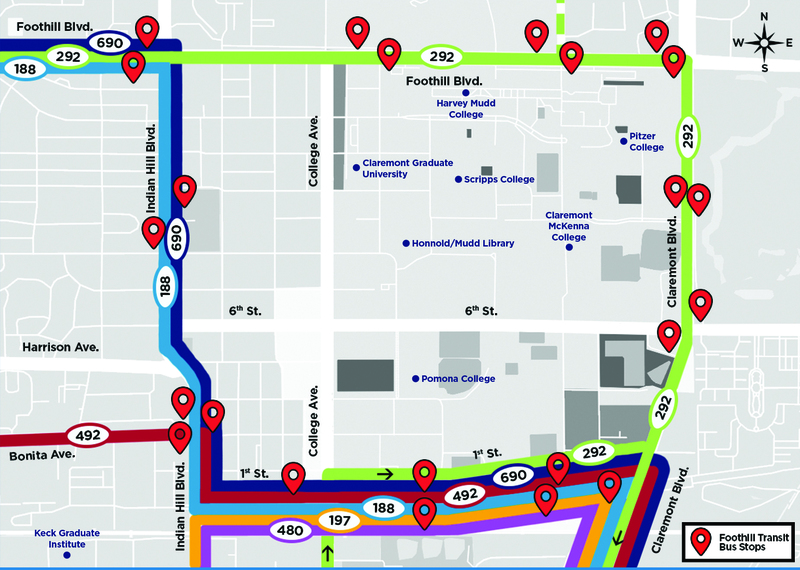 Foothill Transit Lines 188, 197, 292, 480, 492, and 690 travel throughout campus, stopping along Indian Hill Blvd, 1st St, Claremont Blvd, and Foothill Blvd — check out the map for locations of stops. Lines 292 and 690 run Monday through Friday, while all other lines run seven days a week. What If I Don’t Know How to Ride the Bus? 1. Use Google Transit or the Trip Planner at the top of our website to find out what bus line you need and where your nearest bus stop is located — then check NEXTRIP for real-time updates that show exactly when your bus will arrive. 2. Go to your bus stop — it’ll be marked with a large sign in Foothill Transit blue and green. 3. Make sure you board the right bus — when a bus pulls up to the stop, look at its line number and destination on the sign above the windshield. 4. Pay your fare — just touch your Class Pass to the “TAP” symbol right on the farebox and listen for the beep. 5. Move as far to the back as you can, and find a seat or hold onto the handrail — please leave seats at the front open for elderly and disabled passengers. 6. Request a stop — when the bus approaches your stop, pull the cord or press the tape running along the windows, then exit through the doors in the back! Still have questions? Check out our Bus Basics, call us at 800-RIDE-INFO (743-3463), or visit our full website at foothilltransit.org anytime! When Can I Use My Class Pass? If you received your Class Pass in the fall, it’s good through the end of the semester – just before winter break. If you received your Class Pass in the spring, it’s good through the end of the summer session. If you’re still enrolled in school at the start of the next semester, your Class Pass will automatically reload – but you’ll need to use it at least once within the first two weeks of school starting to keep it active. If you have any issues with your pass, visit the Connection. Where Can I Go with My Class Pass? Ready to plan your trip? Let’s go!